You do know that John McCain said he wanted to work across the isle and work with democrats and come up with a bi-partisan bill. He wants congress to act as it should, working with one another not just blindly siding with your own party. What he did and said took courage and he is 100% right... the old fart. Well I can say I've been to the moon or say I'm a space alien or say that I use to live on Jupiter...doesn't necessarily mean what said is true. 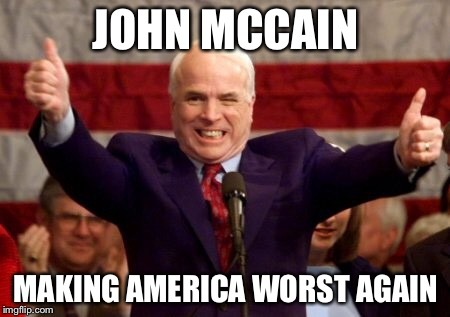 John McCain did that for spite against Trump. McCain does not give a damn about the American people. He showed his true colors. Well The Senate is about to be in for a rude awakening, because Trump suspended their healthcare.